The addition of veteran quarterback Mike Reilly, the most coveted player in free agency, and Canadian offensive lineman Sukh Chungh provide immediate upgrades to a B.C. offence that struggled last season. Reilly's presence should bode well for returning receiver Bryan Burnham. The addition of WR Duron Carter will certainly make things interesting on the west coast. GM Ed Hervey bolstered his secondary by signing free agents Aaron Grymes, Chris Edwards and Josh Woodman but defensive lineman Shawn Lemon (11 sacks) and versatile running back/kick returner Chris Rainey have left. The return of kicker Ty Long (pursuing NFL opportunities) would also help immensely. President/GM John Hufnagel kept a key piece of Calgary's success by re-signing starting quarterback Bo Levi Mitchell (four years, reported $2.8 million). Veteran receiver Eric Rogers and defensive lineman Cordarro Law were also retained. But the club lost offensive lineman Spencer Wilson (Montreal), receivers Lemar Durant (B.C.) and DaVaris Daniels (Edmonton), defensive backs Patrick Levels (Montreal) and Tunde Adeleke (Hamilton) and defensive linemen Micah Johnson (Saskatchewan) and Ja'Gared Davis (Hamilton). Some big holes to fill. After losing Reilly, GM Brock Sunderland went to work remaking his roster. 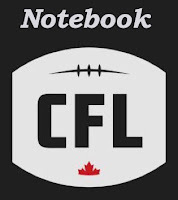 He re-signed offensive lineman Travis Bond while adding eight free agents, including quarterback Trevor Harris, tackle SirVincent Rogers and receiver Greg Ellingson (all from Ottawa). Defensively, linebackers Larry Dean (Hamilton) and Jovan Santos-Knox and defensive backs Don Unamba (Hamilton) and Anthony Orange (B.C.) were added. Questions of potential salary-cap ramifications do remain and the Eskimos now face the challenge of blending so many new faces into a team concept. Quarterback was a priority in free agency and Saskatchewan was a key player in the Mitchell sweepstakes. But the Roughriders turned to starter Zach Collaros, who'd become a free agent, after missing out on Mitchell. The additions of running back William Powell (Ottawa) and all-star defensive lineman Johnson (Calgary) are both very solid but Canadian Cory Watson (B.C.) doesn't fully address the team's need at receiver. The Riders also have a major hole to fill on their defensive line with the departure of Willie Jefferson (10 sacks, two pick-six returns) to Winnipeg. The arrival of Jefferson gives the club a proven pass rusher and could help minimize the loss of linebacker Santos-Knox to the front seven. A big move prior to free agency was extending stalwart linebacker Adam Bighill, the league's top defensive player last year, but the loss of safety Taylor Loffler (Montreal) will hurt. The same applies with Chungh heading to B.C., especially following centre Matthias Goossen's recent retirement. Winnipeg's offensive line was key for both quarterback Matt Nichols and CFL rushing leader Andrew Harris. The departure of Dean (East Division's top defensive player last year) and defensive back Don Unamba (Edmonton) leaves two big holes to fill. Hamilton also doesn't have a kicker/punter with veteran Canadian Lirim Hajrullahu still on the open market. But quarterback Jeremiah Masoli remains under contract and slotback Brandon Banks was extended prior to the start of free agency. So too was running back Alex Green but there are depth questions now with Canadian Mercer Timmis (Toronto) and John White (B.C.) both having left. So far so good with receiver B.J. Cunningham extended, defensive lineman John Bowman re-signed and the free-agent additions of Wilson, fullback Christophe Normand (Ottawa), receiver DeVier Posey (B.C. ), defensive backs Loffler and Levels and linebacker Bo Lokombo (B.C.). Having five quarterbacks on the roster ensures much competition, but the big question at camp will be whether former Heisman Trophy winner Johnny Manziel can firmly establish himself as the Alouettes' starter. The start of free agency wasn't kind to GM Marcel Desjardins, who saw his starting quarterback (Harris), running back (Powell), a top offensive lineman (Rogers) and receiver (Ellingson) all depart. Desjardins did sign former B.C. quarterback Jonathon Jennings, who' ll compete with Dominique Davis for the No. 1 job. Jennings threw for 5,226 yards in 2016 but since then has registered more interceptions (26) than TDs (24) while Davis has appeared in just 12 CFL games over three seasons, having completed 57-of-93 passes for 750 yards with three TDs and a pick. James Franklin remains Toronto's starter after GM Jim Popp came up short in the Mitchell sweepstakes. Popp remains on the lookout for a veteran quarterback - like, maybe Travis Lulay - to mentor Franklin, who's entering his second season with the Argos. Popp also continues to woo former Edmonton receiver Derel Walker, who'd complement veterans S.J. Green and Armanti Edwards. Defensive linemen Shawn Lemon (B.C.) and Tobi Antigha (Saskatchewan) are solid additions. How many games will East Division teams win against their West Division counterparts? Last season, Eastern teams were a dismal 12-28 versus their Western counterparts, with Ottawa (5-5) owning the best record. But that was before the departure of Harris, Powell, Rogers and Ellingson to the West in free agency.